The Salt Lake Valley experiences about 50 inches of snowfall annually. Although we live in a climate with snowy winters, there are occasions when our area is hit by a sizable storm, even by our standards. 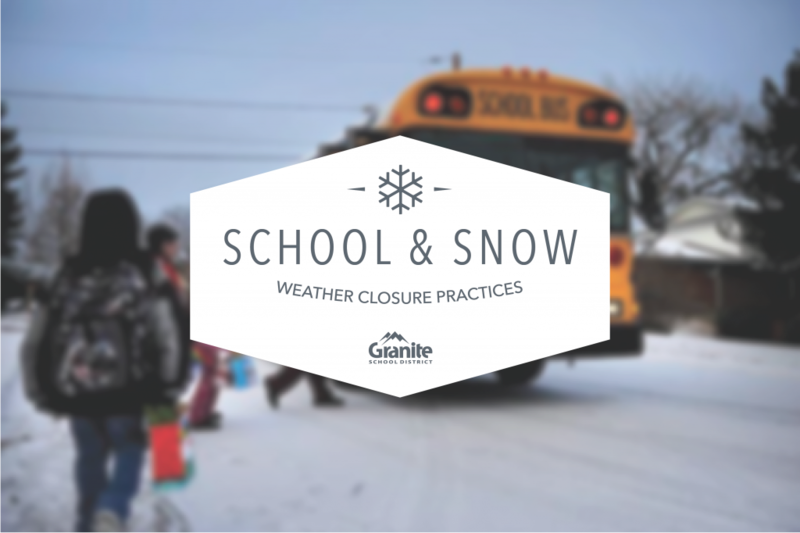 While snowstorms do present obstacles, Granite School District aims to keep schools open whenever possible. Why keep schools open during a snowstorm? Prior to and during a snowstorm, we receive up to date reports on road conditions, transportation capabilities, and the status of our school buildings. We will keep schools open if these reports indicate we can safely transport children, and open and operate our buildings. Nearly 60 percent of Granite School District students rely on their neighborhood school for breakfast and lunch. These meals are not simply convenient; they provide nutritional needs for kids who may otherwise go without them. A majority of students in the district would remain home alone without supervision if their school had an unscheduled closure. Many families don’t have the luxury of adjusting work schedules on short notice. The district also aims to open schools on time, if at all possible. Granite’s geographical boundaries contain some of the busiest roadways in the Salt Lake Valley, which become especially congested during the morning commute. The regular bell schedule allows buses to complete high school/junior high routes and move on to elementary routes before the height of traffic congestion. Emergency late starts place high school/junior routes in the busiest road times, which can subsequently delay elementary routes even further. As such, late starts are not preferable because they actually may make transportation delays even worse. What if reports indicate significant difficulties? If reports show substantial challenges, individual schools may decide to implement a late start to resolve the situation. The emergency late start schedule still counts as a full day of instruction, thus no make up day in the spring is needed. If it appears a late start schedule will not alleviate conditions, affected schools will be closed. An emergency closure make up day in the spring is included in the calendar. Parents will be notified as soon as possible via phone, email, and district social media should a late start or a full closure be implemented. Please ensure your contact information listed on school records is accurate. The district’s website and social media accounts will also post emergency closure information. My school is open, but it looks bad out there! We trust parents to make the ultimate call when it comes to their child’s safety. Not all streets are plowed at the same time, and snow totals may differ from region to region. If you do not think it is safe to send or take your kids to school during a weather incident, please keep them home. School officials will be lenient regarding tardiness and absences during inclement winter weather. In short, if you have options, feel free to exercise them. If not, know that we are here for your children. If there is a closure, how is it communicated out? Phone, email and district social media. How will we know before driving to the school that class has been canceled? Notifications will be sent out via phone, email and district social media. Good to know education is not what school is about on snowy days. We were mistaken and used to make great effort to get our kids to school on storm days, only to have them sit with movies all day in classrooms with missing teachers. Now we’ll be skiing instead.